Your birth, O virgin Mother of God, heralded joy to the universe, for from you rose the Sun of Justice, Christ our God. He took away the curse, He imparted the blessing and, by abolishing death, He gave us everlasting life. "The day of the Nativity of the Mother of God is a day of universal joy, because through the Mother of God, the entire human race was renewed, and the sorrow of the first mother, Eve, was transformed into joy." "The feast of the Nativity of the Blessed Virgin Mary, celebrated on Septermber 8, belongs on the list of the Twelve Major Feasts of the Byzantine rite liturgical year (cf. Gospel of Sinai, 715 A.D.) We usually do not celebrate the birthday of the Saints, but rather their "birthday to heaven," that is, the anniversary of their death, considered as the beginning of their blessed life with God. 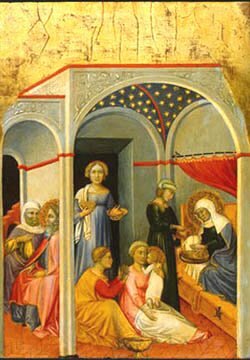 Nevertheless, there are two exceptions, the Blessed Virgin Mary and St. John the Baptist, since we commemorate not only their birthday to heaven, but also their nativity, their coming to this earth." To read more about this feast from Catholic Encyclopedia, click here. Bake a cake! This is, universally, a big feast. Hopefully all of our children will joyfully remember the feast days of the Church, when a cake or some special dessert was made, and a special prayer or poem or hymn was recited in honor of their Mother in Heaven!